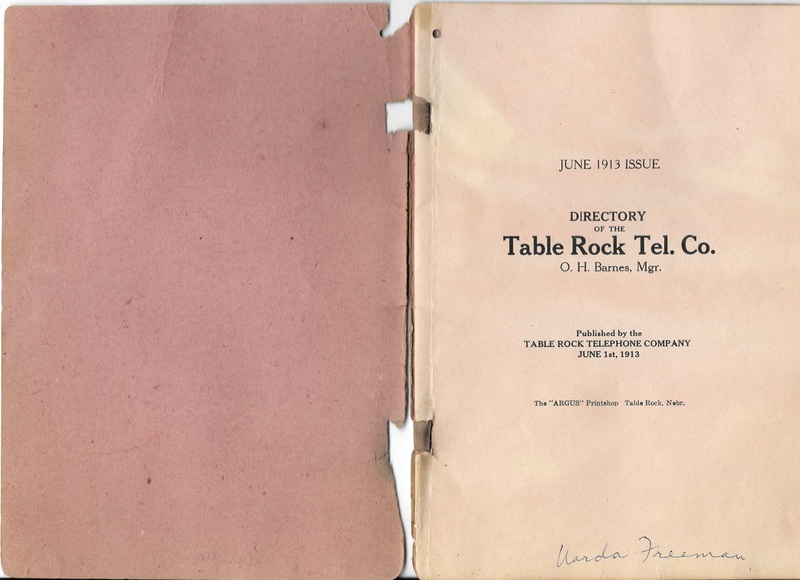 This book appears to have been owned by uarda freeman. Don't chat with the operators. Leave the receiver on the hook. Don't monopolize the line. 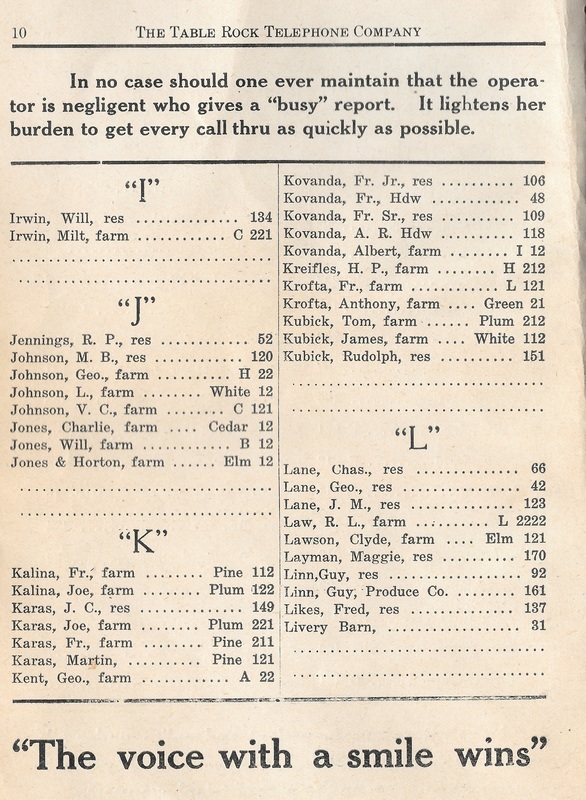 If you're on a farm line, limit your calls to five minutes. And....don't pick up the phone if it's not your ring! That last one will bring a smile to virtually anyone who was on a party line. With a party line, when there was a call, every single phone on the line rang. Each subscriber had a different ring -- two longs and a short, two shorts, etc. So unless it was your ring, you weren't supposed to answer it. Of course, if Mrs. Smith wanted to be snoopy, when she heard Mrs. Jones's ring, she might pick up the phone and try to eavesdrop. Not only might, but did. 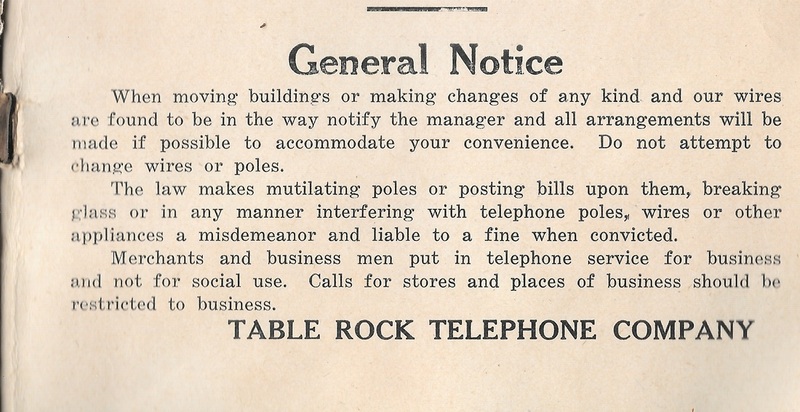 But, the 1913 Table Rock Telephone Company rules were prohibited that! Rule # 2 - don't mess with stuff! instruction guide for how to use a phone! Hales, Hanna, Hansen, Harter, Harter and Beck Office, Hastings, Hays, Heer, Helmer, Herrick, Hesky, Hickman, Hnizda, Howe, Holliger, Hruska, Hubka, Hunzeker, Hylton, Hylton Drug Store .